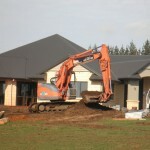 Onsite Development Solutions has had many years experience working alongside builders landscapers and home owners. When building or renovating your house and land you need experienced operators to ensure smooth running of the project. Whether you need the house or shed pad excavated and prepared for building or the section cleared and contoured for your landscape plan we can help. We will work closely with you, your builder or your project manager. Our Zero Swing Digger allows us to work in more confined places protecting buildings and trees. Keeping your building site clean and well set up for efficient drainage is paramount to the overall planning of your project. Soil can be moved and used on site and excess refuse removed from the site for you. Onsite Development Solutions works closely with council engineers to meet the stringent new regulations being imposed on the building industry. Working closely with council engineers ensures that your building projects will meet the standards required. Having safe and weather-proof access to a new building site is an integral start to a good building project. We can also rejuvenate your existing driveway without the added expense of new material. Whether you need a new metal or sand driveway Onsite Development Solutions has the experience to build your new access to your building site. Entrance ways will generally require culverts and we work to the requirements of the local councils to place these accordingly. If you have an existing driveway that has potholes or corrugation we can rejuvenate the tired compacted light metal or sand driveway or track. Our Harley powered rake allows a low cost option to eliminate potholes without the expense of additional sand or metal. The use of the Harley Powered Rake has proven to be beneficial to many customers. Trees, rocks, hedges, old buildings..
Clearing your site ready for building or contouring can be a time consuming job. Onsite Development Solutions can clear your site and remove any refuse from your property. We have a range of equipment and can help you with all sorts of projects. From tree removal (we employ the services of professional arborists when required) removal of rocks, hedges and also old buildings. When it comes to removing old buildings and any discarded material, careful consideration is made to its correct disposal. Have you got a landscaping project? 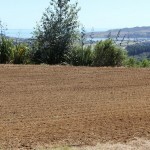 Onsite has the machinery and expertise to level and contour your section, large lawn or property. We will work closely with you, your landscaper or designer to ensure your large scale project can be brought to life. Mounds, rock placement, ponds, tennis courts, gardens and drainage will take shape by using the digger, tractor and front end loader and laser levelling equipment. Onsite Development Solutions will help you and your landscape designer to bring your plans to reality. Onsite has many years of experience digging pools and ponds. Whether it is working with your pool company or landscaper or to your specific requirements you can rest easy knowing that your dig-out will be done professionally by experienced operators. The zero swing digger is an asset in cases where pools are close to buildings and in more confined areas. 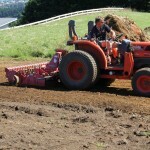 Having the tractor and trailer is also an advantage to the project to move surplus soil around the property.